Bridgnorth Endowed minibus driver and local fundraising hero, Dana Power, is preparing to run his ninth London Marathon at the end of this month. Dana, who is 64, started running nine years ago, after watching the Great North Run and feeling inspired. 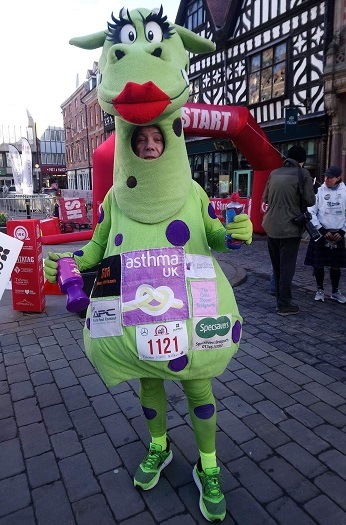 In 2013, Asthma UK were looking for someone to run as their mascot, Puff the Dragon, and Dana agreed to do it as a last resort if no one else came forward. The rest, as they say, is history and Dana, who is also known as Puff the Bridgnorth Dragon, has run thousands of miles dressed head to toe in green and purple. In total, Dana has raised almost £40,000 for various charities, the main one being Asthma UK as he suffers from asthma himself. By the end of the 2019 London Marathon, he is hoping to have raised £27,00 for them. Over the years, he’s built an impressive track record, completing a total of thirteen marathons all over the world, including New York, Chicago, Berlin, Philadelphia and Brighton, as well as more than fifty half marathons. Dana, who’s been a minibus driver at Bridgnorth Endowed School for almost a year, is hugely grateful for all the support he’s received from his family, especially his wife, Tina, and the Bridgnorth community.